Whether or not crate training your new puppy or adult dog has crossed your mind as an option, it is one of the most important first decisions new dog owners face. 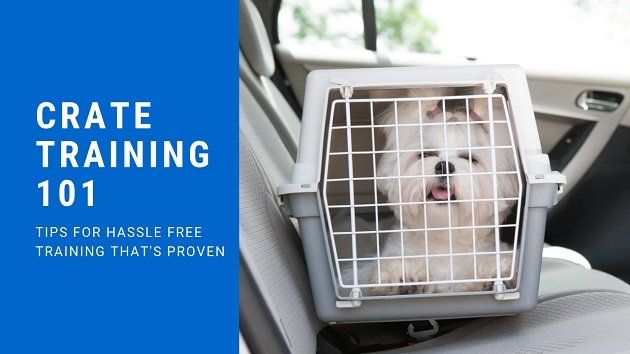 There are many benefits to crate training and when done properly a crate becomes a safe and comforting place for your puppy. 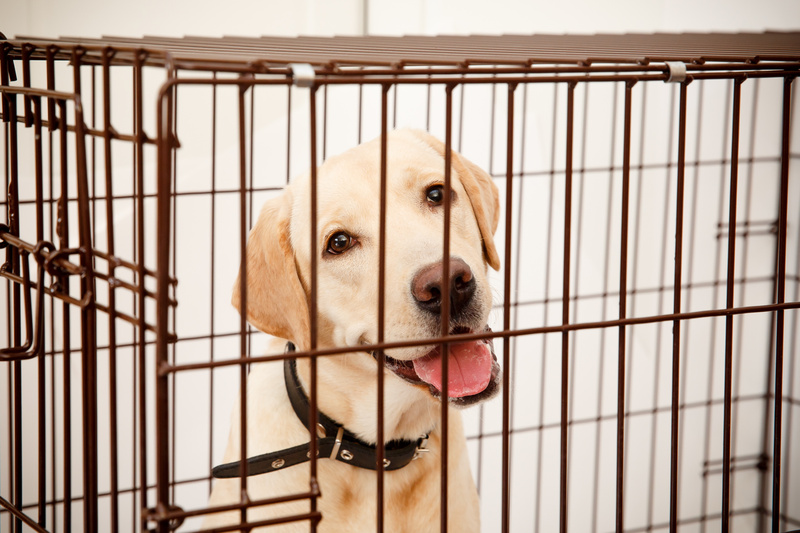 Crate training your puppy or older dog provides them with a profound sense of security. Dogs naturally live in dens. Dens protect them from danger, keep them warm and dry, and help them to keep their young safe and protected. The den is so important to a wild dog that the mother will train her puppies to go to the bathroom outside the den. 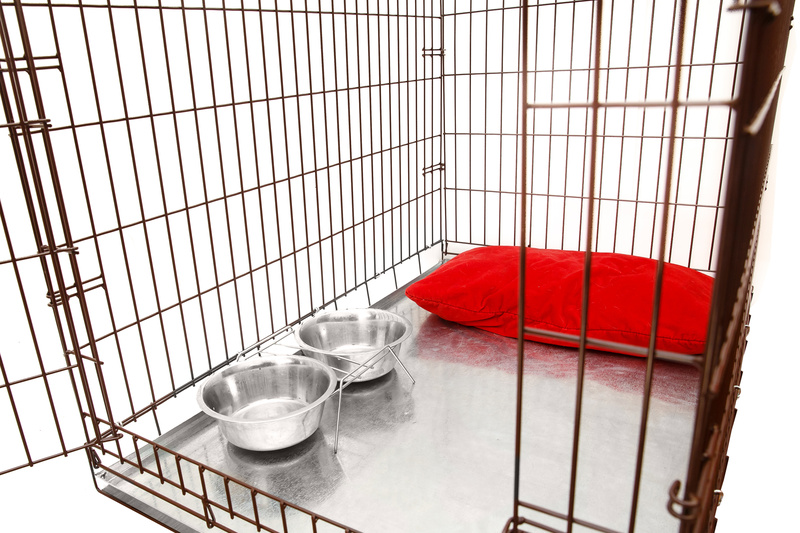 Using a crate as a modern dog den, your dog’s natural instincts will ensure they keep their crate clean and dry. So you’re not only providing a safe and comforting place for your dog to rest you are using the den to help with House Training Your Puppy. 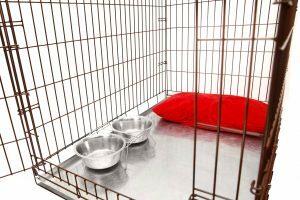 While some breeds are definitely more nervous, and therefore potentially destructive, than others, a crate offers a sense of security for your dog. Instead of acting out when they feel anxious they can retreat to their ‘den’ and seek calm. *A word about Separation Anxiety. Attempting to use the crate as the solution for your dog’s separation anxiety won’t solve his problem. A crate can prevent your dog from being destructive around the house, but he might get injured in an attempt to escape his crate. Separation anxiety problems can only be resolved by integrating counterconditioning and desensitization with your crate training. You may want to consult your vet for help. See more about separation anxiety below. When you crate train a dog, you’re going to inadvertently provide a structure and schedule. For example your dog will sleep in the crate at night and when you’re away from home. Chances are you go to sleep, wake and go to work at approximately the same time every day. You already have a schedule. When you impose a schedule on your dog it will help them know what to expect. Puppies do best when they have a schedule they can count on because they learn to anticipate what is coming next, which helps to reduce any potential anxiety. It’s similar to us – As Humans, we feel better knowing what to expect. No matter the age of your dog or puppy, I highly recommend all of my clients establish a crate training schedule. Who doesn’t love following a specific plan of action every single day? If done correctly, you can have a potty trained puppy or dog in no time. However, you can’t expect your three month old little puppy to stay inside his crate for 4 hours without any accidents! Also, keep in mind that pups will potty after eating, after a play session and after a nap. 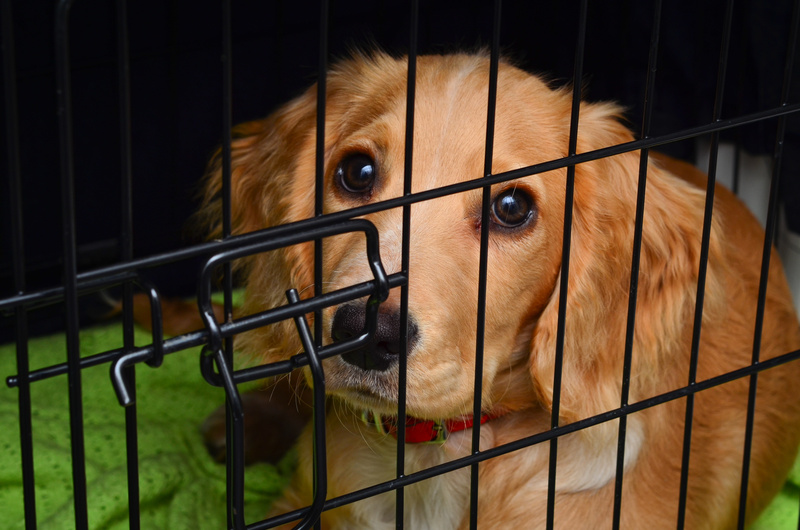 Your dog’s crate training schedule should have some key parameters: Play time for 15-20 minutes, feeding time for 30 minutes and crate time for 1-2 hours. Add 15 minutes to the time puppy spends in his crate every week. You can follow the schedule as is, but if you think your puppy needs to play a little longer, modify it! If you think your pooch wants to go potty, take him outside immediately! Remember to be patient. If your dog is not successful right away, then try to make things easier for him. As your puppy grows, you will be able to leave him inside the crate for longer periods of time up to 6-8 hours per day. 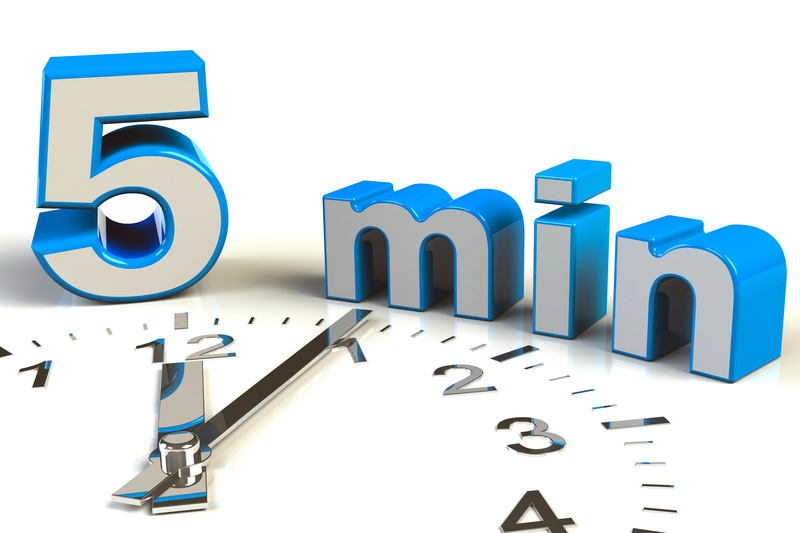 Remember to include exercise in the morning and evening too! In order for crate training to be a success, you will need to make sure you. 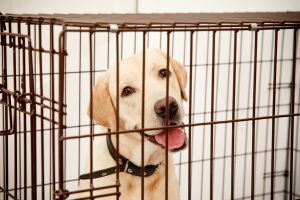 Let’s take a look at some of the decisions you need to make before you begin crate training your dog. Crates come in every size, shape, material, and color. Before purchasing a crate consider the size of your dog and how the crate will be used. For example if you travel a lot then you may want to consider a light weight portable crate. If you have a large dog and will be gone during the day you may want to look into a larger and more permanent fixture. Your dog’s crate should be just large enough for him to stand up and turn around in. If it is too big, it won’t feel comfortable for him; dogs prefer cozy dens in the wild. If you’re buying a crate for a new puppy, choose a crate size that will fit him when he’s an adult and block off the excess crate space so he is unable to eliminate at the back and sleep in the front. Where to put your crate is the next important decision. Dogs are social creatures and will want to be where the family spends their time. Some dog owners like to keep two crates, one for their main living space and one in their bedrooms. You have the perfect crate, and you have the perfect dog, now what? Depending on the age of your dog you’ll have to time your crate use strategically. As stated above, young puppies simply cannot hold their bladder. Puppies less than 12 weeks need to go outside every hour or two. Once they’re older than 12 weeks they are able to hold their bladder however not for very long. Like any other dog training issue some judgment calls need to be made to decide how much time is too much for your dog to be in his crate. Additionally older dogs may have bladder control issues. Plan your crating based on your puppies needs. Remember that if you crate them for too long they’ll be forced to go in their crate and that type of accident can really knock training off track. Not to mention it makes them unhappy to be forced to sleep in a messy crate. Crate training an older dog requires a few minor twists. Don’t use the crate for punishment. Your dog’s crate is supposed to be a safe and happy place. It is the location he sleeps in. It is where he goes when you’re not home. It is his sanctuary. If you use his sanctuary as punishment, then it loses its value. It is no longer a safe place and being confined there will breed resentment and unwanted and destructive behaviors. Crate Training Tip: A word about positive reinforcement. Both dogs and puppies respond to praise. 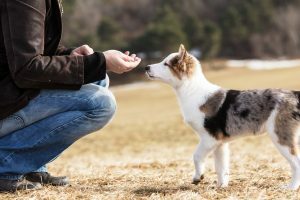 One of the most difficult hurdles for many new dog owners to get over is the fact that positive reinforcement works a hundred times better than negative reinforcement. So what’s the big deal about whether or not to do positive or negative reinforcement? 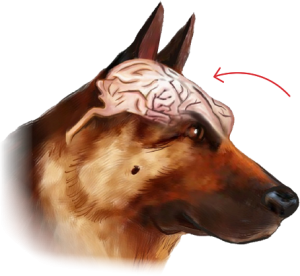 A pat on the head and a treats will have a stronger impact on your dog’s behavior and training than a loud yell and a smack on the rear. One teaches fear and causes anxiety and a whole host of other problems, the other encourages your dog to continue to do the right thing to earn more treats and praise. It doesn’t matter what you’re training them to do, positive reinforcement just works better. Reward your dog for good behavior. This is perhaps the single most important puppy training tip to remember as your puppy grows. Next, it’s time to acclimate your dog to his crate using positive reinforcement. The best way to do this is to make his crate the place where all his favorite things happen! Start feeding your puppy his meals from inside his crate, along with his water and all his treats. 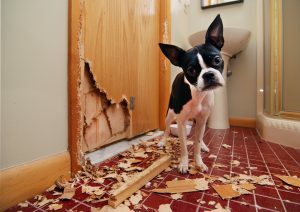 Crate Training Tip: Don’t close the crate door during this phase of crate training. Put a nice comfy bed or blanket inside so it’s the most comfortable place for him to sleep. They have crate beds on the market that are designed to fit the crate exactly. Basically, anything you can think of that is good should happen inside the crate (like a favorite toy and treats). This is about positive reinforcement so your dog learns that good things happen in crates, that way he won’t put up as much of a fight when we get to the stage where we ask him to be in his crate for hours at a time. We want your puppy dog to think of his crate as the ultimate “Happy Place”; where he goes when he wants to feel safe, is sleepy, or wants to relax. Once your dog is comfortable going into his crate to eat, close the door while he eats. Then, as soon as he’s done, open the crate door and let him out. Next, throw a stuffed Kong toy in your dog’s crate and close the door. 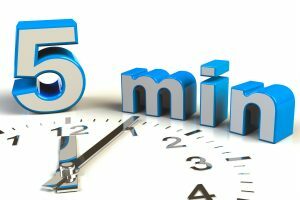 These can take longer to consume, so grab a magazine or just dedicate some time to checking out Facebook and sit within eyesight of your dog while he eats his stuffed Kong treats in his crate (at least 5 minutes). Then open the door and let him out. 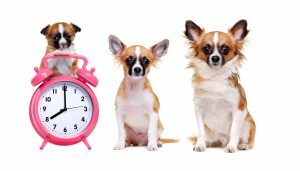 It is crucial during this phase that you balance the length of time you need your dog to stay in his crate with the reality that your dog might need to work on not just barking every time he feels a little anxious or wants to get his way. Pet parents often accidentally create a ‘Bad Barking or Whining Habit’ by trying to crate train their dog, but then letting their dog out every time he barks. This is NOT allowed in my house. Just like I don’t let my children get treats they want when they whine, I don’t let my dogs, either. My dogs can’t bark to get ANYTHING they want in their life. And neither should yours. You should teach your dog that barking for food, to go outside, to be let out of a crate, buys them another minute of NOT getting what they want. Sometimes you feel bad for your dog, because he might be feeling anxious about how long he’ll be locked in his crate, especially in the beginning of this crate training process. If you find yourself having a hard time getting your dog comfortable with the amount of time he needs to spend in his crate, I would strongly consider finding a local pet sitter that can help you. Pet sitters are an INCREDIBLY underutilized resource for raising well-adjusted dogs. The value they bring by giving your dog time to interact with other dogs is reason enough why you should consider them. Dog sitters are also a great tool you can use to prevent the overwhelming boredom some dogs feel when adjusting to longer periods in the crate. Separation anxiety is basically a panic attack that your dog has whenever you leave him alone. Dogs with separation anxiety can cause a lot of damage to their crates. But without the proper training, this can actually cause more self-injury to your dog while he’s confined because he tries even harder to escape. Make the crate a positive experience. The first few times you crate your dog they will undoubtedly create a noisy ruckus. They’ll cry, bark, whine and let you know they are miserable. 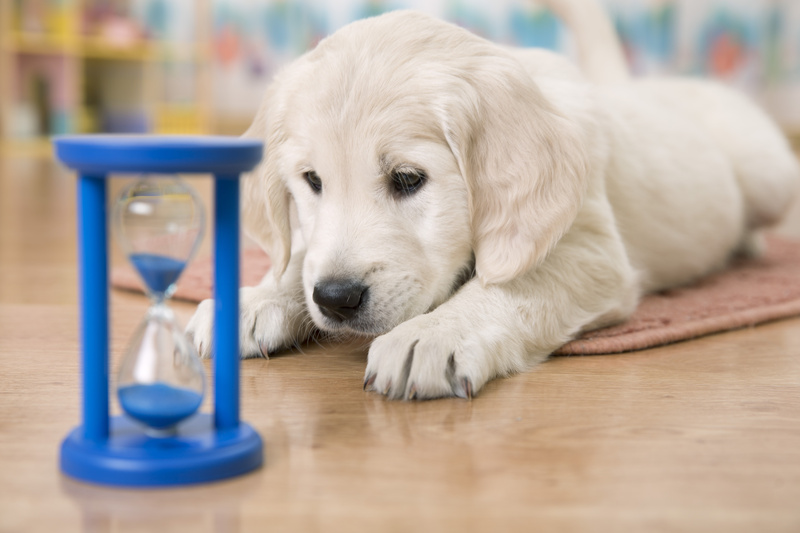 Have patience and faith, crate training your dog is the right decision. Your dog will in very short time become comfortable with their dog crate. To quicken the process reward your dog for going into their crate. Give them a ‘good dog’ and a food treats. Eventually they’ll go into the dog crate voluntarily. If the crate training separation anxiety persists read this. Remember to take your dog outside as soon as you let them out of their dog crate. This is incredibly important especially if you’re working on dog potty training. Create a routine. Let them out of their cage, take them to their potty place, give them a verbal cue like “go potty” and reward them when they’ve accomplished the task. If your puppy is showing signs of separation anxiety. This means that she is uncomfortable being left home alone. Because dogs are social animals, it is not natural for them to be away from their social group – or you – for long periods of time. However, most dogs can be left alone with no problems. Unfortunately your pup is not one of them and you will have to do some work in order to help her over her fear of being alone. Be consistent. Puppies need to feel secure and consistency will not only help them learn the rules more quickly, it will help them feel more secure in your home. 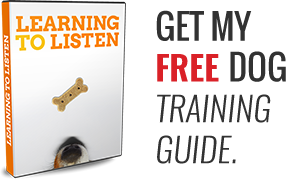 This is important because a dog that feels safe and secure will not only behave better, they’ll trust you more easily and will learn faster during dog training sessions. The same applies to Crate Training. When training your puppy, stay consistent. Stay on schedule. Block out training times for your puppy’s needs, and stick to those time slots. It can be tempting to run longer, but puppies only have so much attention that they can give before they need to let more energy out or get a break. Crate Training will progress as planned, and your dog won’t be upset by schedule changes or loss of attention, for the most part. Remember to stick to that schedule. Be consistent in all things. This includes potty training, leash-walking, positive reinforcement, feeding your puppy, and otherwise. Doing so will prevent confusion in the puppy as to what behaviors to follow, as well. Consistency will make training your puppy surprisingly easy. Dog crate training your canine companion successfully takes several ingredients. It takes patience, a plan, consistency, and above all it takes love and respect for your dog. It can be a hard thing – to train a puppy or older dog. Ultimately, however, it will be very rewarding. Granted, some days will be easier than others; however, as your dog grows – and your training begins to take shape – you’ll be glad you stuck to these crate training tips and devoted the time and energy to learning to crate train your dog the right way. Crate training Dogs offers enormous benefits. It provides them a sense of security and stability and it makes the house training process significantly easier. Who doesn’t want fewer accidents? Of course you do. Crate training is a sure bet if you want to get the best results. 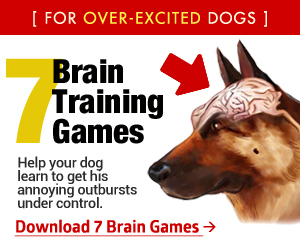 Would You Like To Know How To Program Your Puppy's Personality? Our 'Puppy Programming Course' lets you look over our shoulder as we raise LIVE puppies, where you get to discover what exercises and games you should be playing with your dog during each new week of his life, so that they learn to handle fear, other dogs, new people, and control impulsive behaviors.